A Hurst Cycles Analysis of the S&P 500 Index is Part 3 of an Introduction to J.M Hurst cycles analysis and Hurst trading methods, by Christopher Grafton, Author of "Mastering Hurst Cycle Analysis". 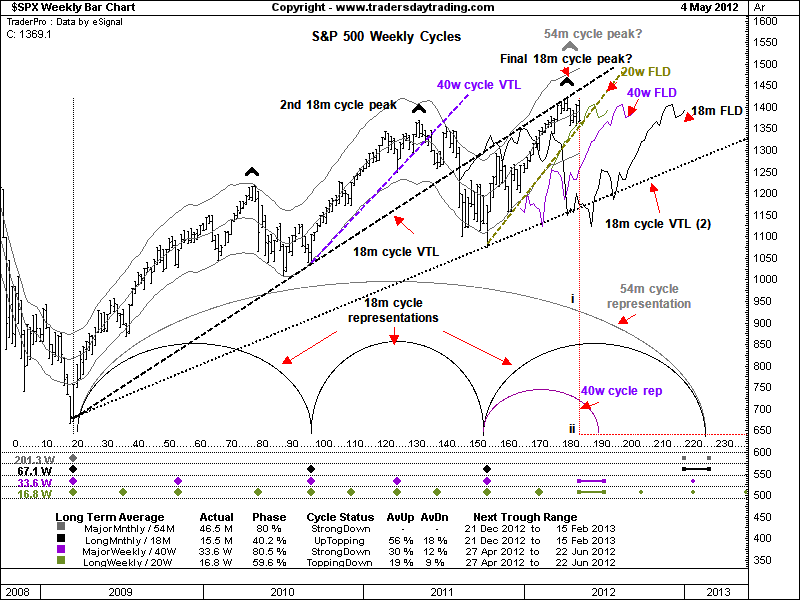 Figure 1 below shows a weekly Hurst trading cycles analysis of the S&P 500 index from March 2009 to 3 May 2012. The various plotted lines and labeling may look a bit confusing initially, but let’s walk through what is being shown here. The first thing to notice is the grid at the bottom of the chart with the coloured diamonds and data. This is the output of Hurst’s third trading tool, the cycle Phasing Analysis. Cycles build upon each other to form composites and it can be very difficult to isolate individual cycles within the composite unless a phasing analysis is carried out. When a long cycle is trending, its shorter component cycles tend to be swamped: their amplitudes are muted and they are therefore hard to pick out. Similarly, during fast sell offs, cycles tend to compress in length, which again makes them difficult to identify. In order to resolve the composite into its component parts, the Hurst analyst phases the chart by picking out the cycle lows and marking their time locations in the grid. Technical analysis reports using Elliott waves, chart patterns, trend trading strategies, Hurst cycles and other stock market time cycles analysis. The time locations of longest cycle troughs (here the 54 month) are marked in the top row; the next longest (18 month here) in the row below and so on. Because of synchronicity, a long cycle trough contains all of the troughs of the shorter cycles, which is indicated by stacks of diamonds, for example at grid 20 to the left of the chart. The real purpose of phasing analysis is to calculate the period and status of each cycle in the composite. Here we can see that the Long Monthly cycle (the 18 month) has an actual period of 15.5 months; is 40.2% along its path and its status is therefore Up-Topping. We can also work out the average percentage change of upswings (56%) and downswings (18%). Finally, we can estimate when the next trough is due: for the 18 month it is between 21 December 2012 and 15 February 2013. Take a moment to study the grid and the diamond placements. The black VTL drawn between the last 54 month cycle low in March 2009 and the first 18 month cycle low in September 2010 (grid 95) shows the broad direction of prices over the last 37 months. This VTL was broken from above in August 2011 (grid 143) which means that the previous peak could be that of the 54 month cycle: thus, the status of the cycle in the lower grid is Strong Down. The problem with this interpretation is that the most recent peak (5 April 2012) is higher than the purported 54 month peak in April 2011. While this is not impossible (think of an Elliott Wave expanded flat), the more conservative approach is to plot the VTL from the origin through the second 18 month cycle low – 18 month VTL (2). The 54 month cycle is comprised of three major components (the 18 month) rather than the more usual two, which gives you two choices. Here we will use the second VTL. If there is a downside cross of this line by prices (somewhere between 1200 and 1300) then we know for certain that the next longer cycle (the 54 month) has reversed – this of course is very useful information and has important implications for downside risk going forward. However, it would also be a very late signal. So is there any way to get a head start and call the top earlier? One way would be to look at the status of the shorter component Hurst cycles. A twenty week cycle VTL has been drawn towards the end of the data (in olive) and this looks vulnerable to a breakdown –in fact it has broken on the daily chart. If this VTL goes then we know that the 40 week cycle peak is in place. Since an 18 month cycle consists of two 40 week cycles, this first peak could also be that of the 18 month cycle. Alternatively, the 18 month cycle peak could come higher and later. We need some additional evidence to convince us that the upcoming 40 week cycle peak will not be exceeded and is therefore also the top of not only the 18 month cycle, but also the long 54 month. If the current 18 month cycle advance still has upside power and we are therefore likely to see a second higher 40 week cycle peak, then it will show in an FLD upside projection. A black 18 month FLD has been plotted and prices crossed up through it on 27 January (grid 170) at 1,315. Subtracting the 18 month cycle low on 7 October 2011 at 1,074.77 from the value of the FLD cross (1,315) gives a difference 240.23 points. Recalling the earlier example using offset ideal cycles, it should be that the cycle will carry the same distance beyond the FLD cross, that is to say up to 1555.23 (1,315 + 240.23). What happened however was that the purported high at 1,422.38 on 5 April fell short by 133 points. This undershoot is a clear indication that trend (the sum of the longer cycles) is working against the advance and that a top is likely in place. This in turn suggests that the 20 week VTL cross will call not only the 40 week peak, but also the 18 month and therefore, since it is the third and last in the series from 2009, the 54 month cycle peak. For extra clarity the cycles are represented by semi-circles in the lower part of the chart. The long grey one is the 54 month cycle, the black one represents the 18 month cycles and the small purple one the 40 week cycle. The vertical red line (i – ii) at the last date (grid 180) gives a quick snapshot of what is happening right now and supports the information provided in the grid, namely: 54 month - Strong Down; 18 month - Up Topping and 40 week strong down. Finally, let’s take a look at the FLDs arrayed off to the right of the data. This arrangement of tightly clustered FLDs running in parallel Hurst named a cascade. When we see this after a steep advance, it is a warning that a sharp reversal is about to take place. Recall from the earlier description of ideal cycles in anti-phase that when the first cycle crosses down through the second, we know that the cycle has recently reversed. Note that the 20 week looks very close to being crossed, which will add conviction to the 40 week cycle peak call. In this case think of price action as the lead cycle and the FLD as the second out of phase cycle. A penetration also provides a downside projection. At this stage we can only estimate where the intersection will take place, but 1,380 looks about right. The recent high was 1,422, and so the difference is 42 points. Projecting this value down from the FLD cross would bring prices to 1,338 – other things being equal. Turning our attention now to the lower 40 week FLD (purple) it looks like a price cross would take place at around 1,350. Since the 20 week FLD downside projection is 12 points lower, it means that the 40 week FLD is also vulnerable to a cross. We can therefore make another projection lower from here. Taking the difference again between the FLD cross (1,350) and the high (1,422) gives 72 and subtracting this value from the intersection projects down to 1,278. We can do the same again here with the 18 month FLD (black, lowest). If this is crossed at 1,278 then we have a final projection down to 1,134, which puts prices back into the August to October 2011 base area. This has been a whirlwind tour of Hurst’s main concepts and a brief analysis of the S&P 500. I hope it has been useful. Hurst trading cycles analysis seems complicated at first, but once you get the hang of it, you will start to see the benefits. An adept Hurst cycles analyst is able to draw the curtain back on the market, so to speak, and look at the inner workings with more clarity. Having a clear view of what is actually going on rather than guessing or relying on tired, more traditional tools will help you manage risk more effectively and trade with more conviction.